The Gridiron is getting to be a bit like Christmas – what that time again already? This is the fifth time I've done this ride and when combined with the ride to and from the ferry it makes a satisfying century. The forecast had been pretty iffy all week but then suddenly it was transformed to a forecast of unbroken sunshine all day. What's more the North East wind in the morning would give me a bit of a tailwind on the way to the ferry and then swing round to the North West to give a tailwind on the way back. Perfect! The only fly in the ointment was that Wightlink had decided to introduce its winter timetable two months earlier this year so the ferry I normally catch no longer exists. A rather early start was called for. I'm not a natural early riser, left to myself I would seldom surface before eight o'clock. Setting the alarm for 5.00 am was a severe shock to the system! I seemed to be checking the time every ninety minutes all through the night, and so, most unusually, I was awake just before 5.00. I left the house at 5.45 and set off under a beautiful starry sky. No moon but Orion's belt was clearly visible. It feels like a big adventure being out on the bike at this time and the roads were beautifully quiet. Just before Niton I met a badger trotting along at the edge of the road. I pedalled behind him for about 50 yards until he disappeared through a gap in the hedge. Frost was sparkling on the grass and I was glad of the climb over Blackgang to help me warm up a bit. The road along the south coast is fairly straight and I could see a red light flashing in the distance. It could only be fellow Wayfarer Tony, but I didn't want to catch up with him just yet, it was quite magical being alone in the dark. The sky began to lighten, a Robin sang, and as I turned right at Brighstone the sun was beginning to rise. It was another couple of miles before I caught up with Tony and as we dropped down towards Yarmouth the fields filled with mist. We arrived at Yarmouth at exactly the same time as Alan on his recumbent and joined a large throng of cyclists at the ferry. 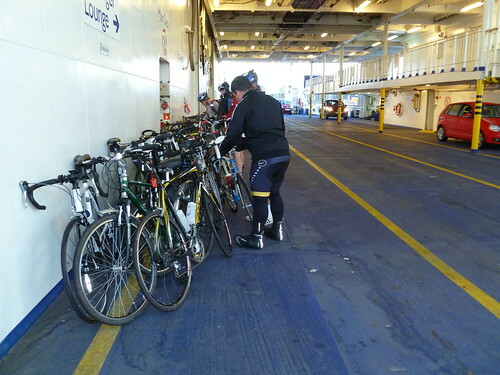 I managed to be first on the ferry to grab a good spot for Roberta but most people had to lean their bikes several deep on the ship's side. I'd already had an excellent morning's ride so Wightlink's tea and toast went down particularly well. It was a large peloton of cyclists that rolled off the other side and through tiny lanes to the event HQ. I don't know if it was the Wiggins effect or the beautiful weather but there were cyclists everywhere. We were soon engulfed by the throng at registration and it took quite a while for our little group to find each other again! The others are here somewhere! I always enjoy cycling in the New Forest, its so much more open than the Isle of Wight. The ponies and donkeys were out in force again but unusually this year we saw no free roaming pigs (unless you count the cyclists wolfing the biscuits at the tea stops!) There were however far more cyclists than in previous years and the good weather had brought out all the Sunday motorists too. I have to admit I didn't enjoy the ride as much as I have done previously, there were rather too many near misses. A camper van overtaking a line of cyclists came very close to a head on collision with an oncoming car. Even more worrying was a group of cyclists who were on the wrong side of the road on a tight bend as a white van came the other way. I think it was only because he too was on the wrong side of the road that they managed to miss each other! The event is organised by Wessex CTC but an element of racing seems to have crept in and there were very few touring bikes in evidence. However, some clearly had a more relaxed approach. Definitely the star of the show! Tea and biscuits are provided at all the checkpoints. This year the queues were far longer than usual but the volunteers did a brilliant job. I know from the Randonnnee that feeding cyclists is hard work and biscuits were disappearing faster than packets could be opened! There was an excellent spread laid on at the finish but unfortunately we had to stop stuffing ourselves on cake and head back to the ferry or we would have another hour to wait. 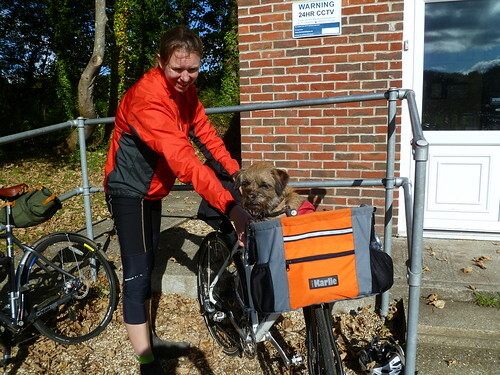 We made the ferry with 5 minutes to spare and I settled down to eat the remaining contents of my saddlebag! Our early start meant we were able to cycle back in the daylight with a gentle tailwind to speed us on. It had been a good day, 104 miles cycled, but strangely it was the dark miles of the early morning that I had enjoyed the most. Posted by Hilary on October 19th, 2012. 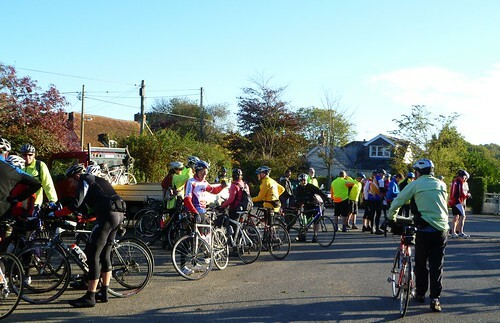 It seems that the New Forest Gridiron Ride has become a little too popular – the numbers seem to have swelled a fair bit. I read that there were a few incidents of irate motorists passing cyclists too closely, and perhaps a few cyclists not helping themselves. There was an accident involving at least one of the cyclists, I understand. Well done on getting a ton in at this time of year, Hilary. Well done indeed. We were down in Hampshire this weekend and my cousin's husband (Jimmy) mentioned that he'd seen hordes of cyclists out on the roads the weekend before. He reckoned "thousands" and thought it must be the CTC annual ride but I don't think there is such a thing is there? It must have been you and your companions! A great early morning start: Orion's belt, Badger for company, and frost on the ground. ... left to myself I would seldom surface before eight o'clock. Mary has a theory about this. In her view there are early risers and late risers, and a key element of compatibility for two people is to synchronize their rising habits. Since she's an eary riser, guess when we get up? LOL, I love the early mornings, and you are so lucky to have seen a badger! I have only ever seen dead ones. There are none at all on our island. Love your reports of this ride Hilary, it sounds like a grand day and a lot of fun. I try to keep out of big peletons due to the relaxed nature that seems to follow with no on in particular looking out ahead. HOw long is the ferry crossing to the IOW by the way?